The Memorial Park commemorates those who died in service or were killed in action during World War One. In 1921, an avenue of 28 trees was planted in the park in memory of the fallen and memorial tablets placed at the foot of the trees. 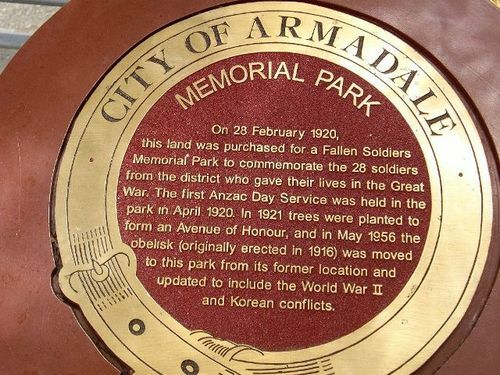 Special attention of all our members and supporters is directed to the picnic and sports gathering to be held at Armadale on Anzac Day, Monday, April 26th. A special train will leave North Fremantle at 9.30 a.m., and at Fremantle at 9.45 a.m., stopping at South-street, South Beach and Robbs Jetty on the way out and returning from Armadale at 5:30 p.m. Hot water, sweets and fruit for the children will be provided free and the cost will be 2/ adults, children under ten half price for the return trip. This is going to be a good outing for the holiday and an opportunity of commemorating the day will be given those who wish to do so by attending a dedication service of a Memorial Park to fallen soldiers, which will take place at Armadale on the Monday at 3.30 p.m. This service is being arranged by the Armadale Ladies' Welcome Home Committee, and it is through their efforts that this land has been purchased and given as a Memorial, the Senior Chapiain from Perth will be participating. Australian (Perth, WA), 23 April 1920. On 28 February 1920, this land was purchased for a Fallen Soldiers Memorial Park to commemorate the 28 soldiers from the district who gave their lives in the Great War. The first Anzac Day Service was held in the park in April 1920. In 1921 trees were planted to form an Avenue of Honour , and in May 1956 the obelisk ( originally erected in 1916) was moved to this park from its former location and updated to include the World War 11 and Korean conflicts.